The original Little Free Library design of 2009 is still available as a kit you can order from the webpage. In 2009 Todd Bol of Hudson, Wisconsin, wanted to create a tribute to his mother, a former school teacher who had instilled in him a love of reading. He built a dollhouse-size model of a one-room schoolhouse, with a bookshelf inside. He mounted this book box on a post in his front yard, with a sign that said FREE BOOKS. Before long Todd Bol’s neighbors and friends wanted to join in on the fun so they asked him to build book boxes for them, which came to be called Little Free Libraries. The Little Free Library movement grew rapidly and it established a LittleFreeLibrary.org webpage. As of November 2018 there were at least 75,000 Little Free Libraries which are registered, including all fifty states and in seventy countries around the world. Little Free Libraries which are listed on the website receive a registration plaque and can give info such as what their Library is made of, or if it is made in honor of someone. A Little Free Library model of a British telephone box is one of the kits sold on the website. What does a Little Free Library do? The Library creates a presence in the neighborhood to share as a community in the promotion of reading. The “take a book” sign on the Little Free Library encourages participants to borrow a book and read it. The Library is a get-to-know-your neighbors way to share your favorite books, provide others with interesting and helpful books, and generate good feeling in the neighborhood. The presence of a Little Free Library along a neighborhood sidewalk sends the message, “we are here, we care, let’s share what we love.” The message of community engagement is an uplift to the whole block. Some Little Free Libraries include a notepad for readers to jot down what they read and why they liked the book. Promotion of reading and community participation including children, can help connect neighbors with one another. Some Little Free Libraries are built at child-accessible height or in a storybook style to indicate that the Library contains children’s books. 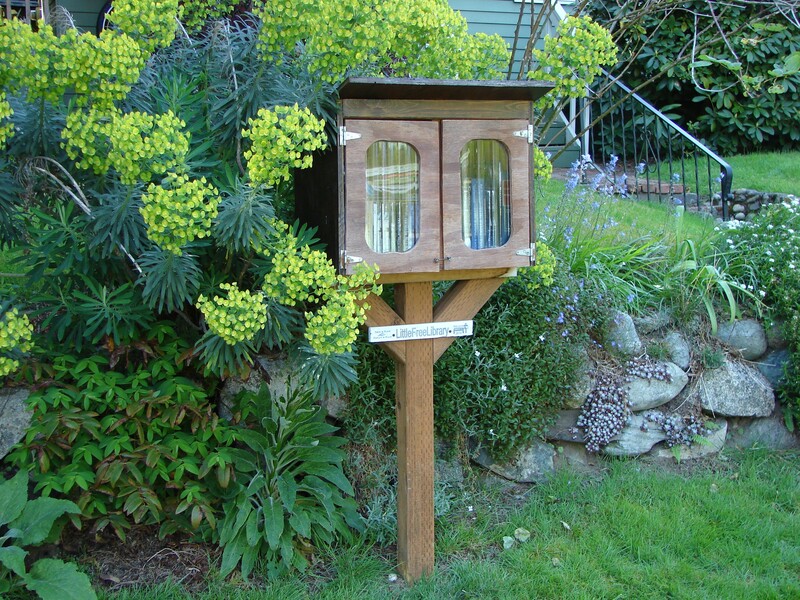 A garden setting enhances the appeal of this Little Free Library in Wedgwood. Use of Little Free Libraries by schools and neighborhoods can help prevent “summer slide,” the loss of proficiency in reading and language skills which occurs when students do not read during their summer vacation. Little Free Library recently had a Kickstarter campaign to plant books in communities where children lack books in their homes, and they exceeded their goal and raised $58,000. The campaign to support reading continues with Little Free Library Big Book Access to help teachers set up Little Free Libraries for students to use during the summer. Little Free Libraries can be utilized by police departments, as well, to help at-risk young people feel supported by their community and have access to books which will challenge them to build a brighter future. What’s inside? This Little Free Library in the Ravenna neighborhood has translucent doors to entice a closer look. Books can change a person’s life with inspiration, create bridges of understanding between generations, and bring communities together to share wisdom and promote positive values. The Little Free Library Big Book Access Project seeks to contribute to this effort. For a family or neighborhood project, consider setting up your own Little Free Library this summer. You can order a kit from the website or get creative and build your own model. The Seattle Times newspaper’s book editor wrote this humorous observation of how her neighbors interacted with the Little Free Library. Sadly, Todd Bol of Wisconsin, who founded the Little Free Library movement in 2009, died in October 2018 of pancreatic cancer. The nonprofit Little Free Library foundation will continue to change the world in Todd’s memory, one book at a time. This entry was posted in Neighborhood features and tagged books, community engagement, love of reading, Seattle. Bookmark the permalink. I’m a major fan of Little Free Libraries! I was truly on the verge of putting one in front of our place but a neighbor two doors down beat me to the punch and I felt it would be bad form to arouse competition. 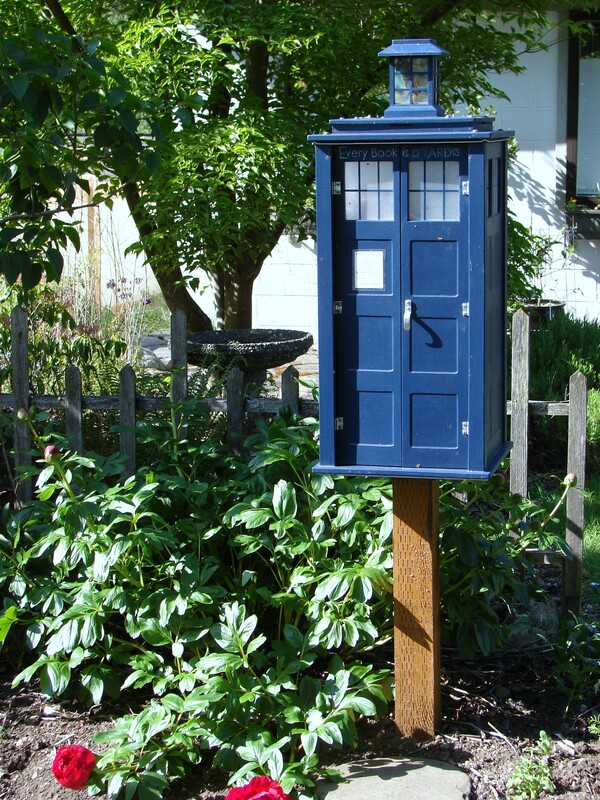 Love the Dr. Who Little Free Library in Wedgwood…….. This is the honest truth, the first time I saw a Little Free Library, I didn’t know what it was. It had a plaque so then I found the webpage. I don’t agree with you that your Library would be in competition with the neighbors! Think up a harmonious design and then the two neighboring Libraries will be a Duet Singing the Glories of Reading. We have one and people love it! I am putting this post on our libraries Facebook page! I didn’t know all this! The Little Free Library’s Kickstarter campaign runs through May 21, 2015. I hope that folks who see my blog article will link to that page and find out more. Portland has definitely adopted them with open arms and open books!